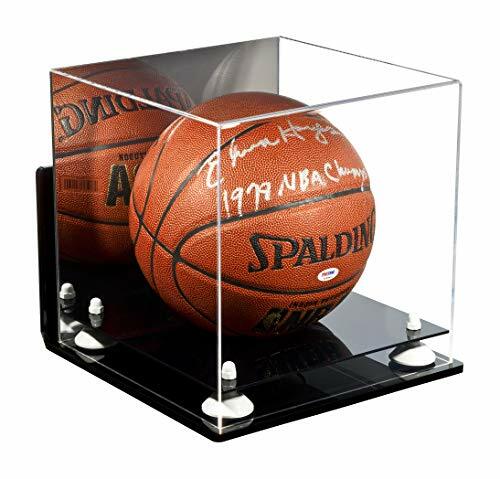 Protect your collectible basketball in one of our beautiful, high-quality, display cases. These cases are constructed of 1/8" crystal clear, durable high clarity acrylic. Back is mirrored and wall mount is included. Front and top of case are made from one piece of acrylic (plexiglas), giving an aesthetically pleasing rollover appearance with fewer seams. Black acrylic two-tiered base includes large white metal risers, not cheap plastic like some manufacturers use. A hole is cut in the platform to hold ball in place. Case includes rubber feet on the bottom to protect case from scratching your shelf or table. This is a wonderful gift for any sport fan with a full size basketball (or similar ball) -- (High School, College or Professional) to display. Memorabilia pictured in the display case is not included. Check out the pictures of the various items our very creative customers display with this display case. Manufactured and sold only by Better Display Cases (a Veteran owned company). Please see our other display cases by visiting our other Amazon listings! We would love to help you display your story! If you have any questions about this product by Better Display Cases, contact us by completing and submitting the form below. If you are looking for a specif part number, please include it with your message.